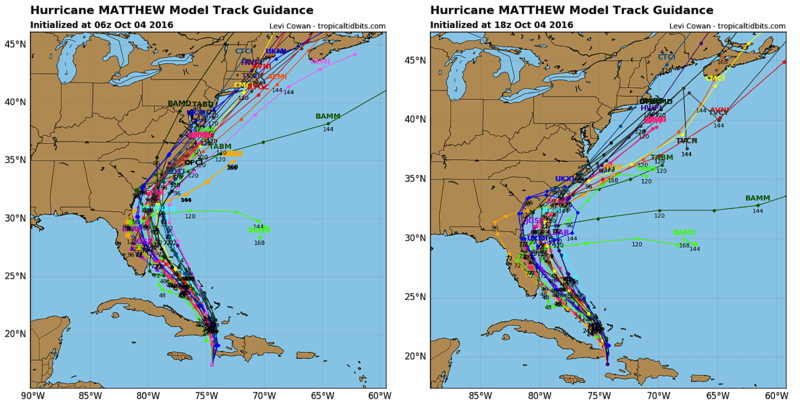 Yes, there is justification for the hesitations and question marks in our forecast: Tuesday afternoon's forecast models nudge Matthew eastward as it approaches NJ. 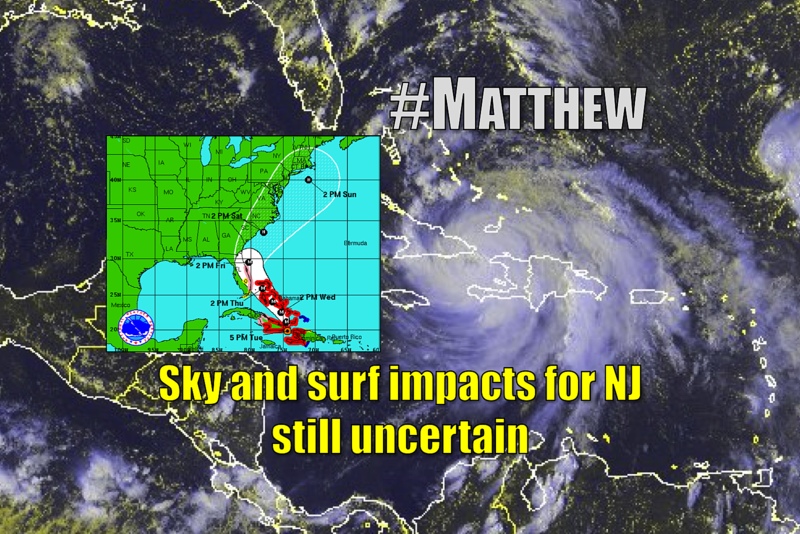 Tuesday morning, I was almost ready to bang the gavel and ring the bell that Matthew would almost certainly cause significant impacts in New Jersey. But I didn't, as there were a couple pieces of evidence that could not be overlooked: the wide spread of possible solutions in the GFS ensemble, and the persistent ECMWF (European) model pushing the storm way off-shore past the Carolinas. Despite what some media outlets are already hyping, uncertainty remains high, the hesitations are still warranted, and we need to continue this "wait and see" approach for another day or two. Will the Jersey Shore most likely experience some surge and rough surf, no matter where the storm tracks? Absolutely. 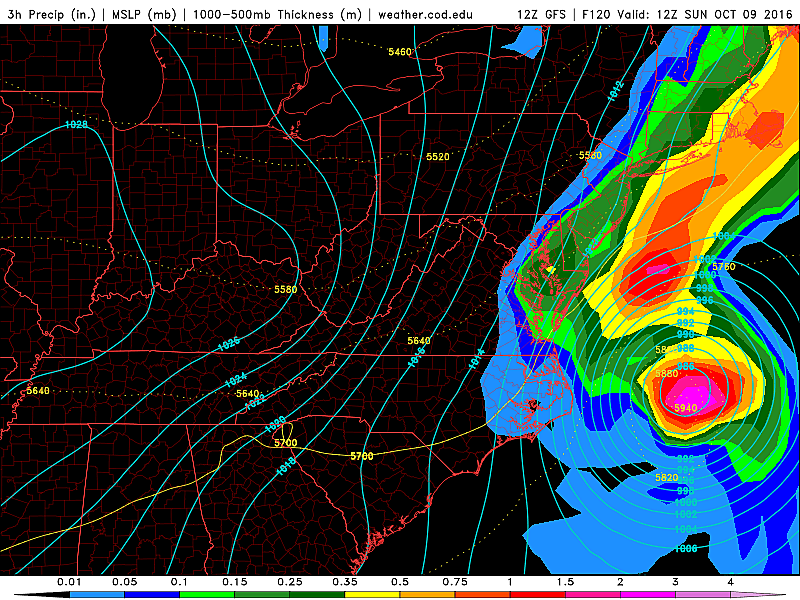 In a "right-turn, out-to-sea" scenario, could New Jersey still experience heavy rain and gusty winds? Absolutely. Could the next model run swing right back toward the coast again? Absolutely. Compare the latest spaghetti plot with the one from this morning. (Before I get torn apart here... Yes, I try to look at the intermediate model runs - 6Z and 18Z - with blurred vision only...) The shift here is notable, I think. Although I caution that the consensus track is still a bit close for comfort, and still leaves plenty of room for concern. The GFS model currently shows Matthew interacting with an approaching cold front. In this solution, the center of Matthew stays east of New Jersey, but we'd still see at least some rain across the state - likely heavy in spots, even if the center of Matthew stays well southeast of New Jersey. The GFS ensemble is still pretty inconsistent amongst its members, but again I like the trend. All I'm saying is... Don't buy into the hype that "OMGZ, a major hurricane is gonna hit New Jersey!" Such language would be appropriate now for the Bahamas and Florida, Georgia, and the Carolinas, but not for New Jersey yet. The big forecast for a big storm like this is an evolution. My message to you continues to be one stressing cautious vigilance. There's still plenty of time for the forecast to change, and I want to make sure we get it right. There will be plenty of time to prepare, if and when such storm preparation is needed. Oh, and keep those fingers crossed. It might be working.